Barrett and Barrett, two renowned and distinct wine stylists working together, finally, is really what this wine is all about. The result is a handcrafted, limited edition Napa Valley wine that reflects our two different, yet complementary, winemaking styles. We hand select small sections of the very best grapes from our Calistoga vineyards, vine by vine. With 20 years of experience growing Cab at this vineyard, we know the most unique and special areas, which have the lowest yields, tiny berries & stressed vines to create the super-selected wine we desire. Our winemaking in the vineyard comes down to our personal selection of each vine and is carried through to impeccable detail in the winemaking. 2015 was the last year of the infamous California drought, and was the vintage where the drought's cumulative effects were most apparent. Our vineyards performed well in the warm 2015 season, the third dry year in a row; however we had an unusually early harvest and much lower crop levels. 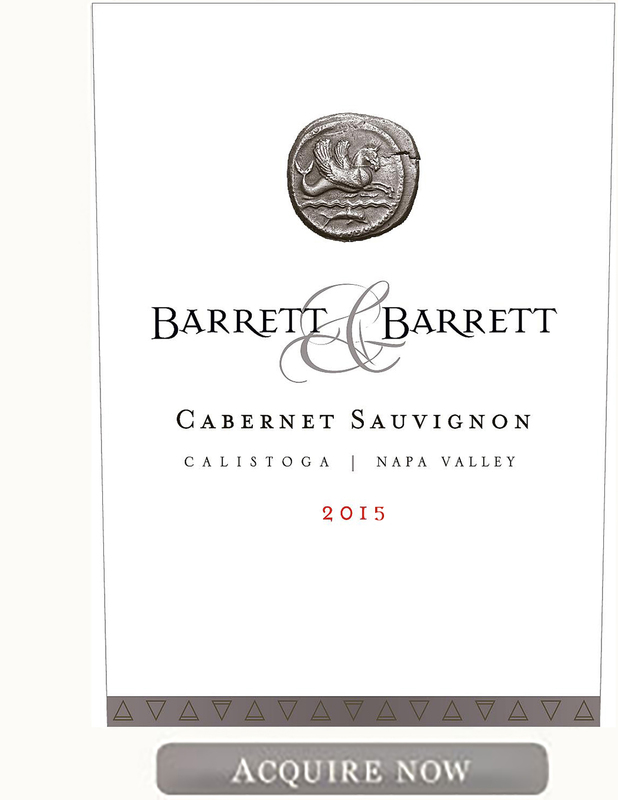 The Cabernet for the Barrett & Barrett is located on steeper and exposed hillside vineyards, bringing a slightly early harvest, August 28th-September 8th. These hand selected blocks showed the super concentration and tiny berries we expect from an extraordinarily dry year. 2015 will be noted for having extremely concentrated, flavorful wines grown under very dry, low-yielding conditions and is expected to be a very popular vintage for collectors due to the intense structure and powerful flavors of these wines. The wine exhibits a deep garnet hue in the glass. My first impression is WOW, just wow. Aromas are expansive and bright throughout - concentrated, ripe and layered. Strong aromatics of dark berry, cedar, spice, cherry, cinnamon and toasty French oak give complexity and opulent appeal. The 2015 was an early harvest producing very little crop, yet what we did pick is spectacular. Across the palate it is a big wine, lush with gorgeous pure flavors and a long, persistent finish that brings to mind notes of warm cherry. Although still very young, the structure and balance of this wine makes it compelling to taste now and bodes well for age-ability. This will be one of the star vintages of the decade.